During renovation work architect Hans Hollein described the Hoffmann-Pavilion in Venice as “a dream of the south”. A statement relating to the tradition of Austrian citizens traveling south to the closest sea. 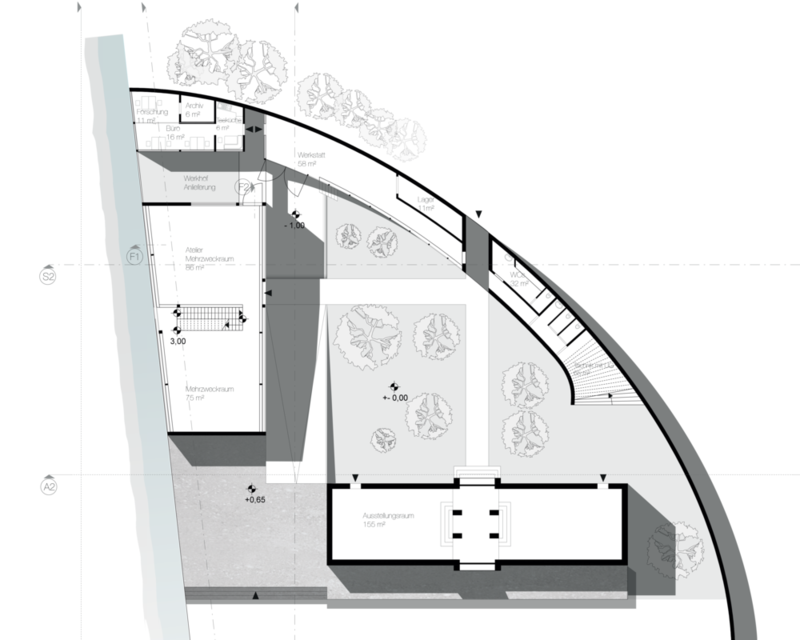 In our approach to design an extension for the existing pavilion we focused on the prominence of water - referring to Hollein’s notion - while trying to embed the canal of Giardini, an element that seems to be ignored by most other pavilions. To do so, a copy of the main body was rotated towards the edge of the water and the new portal moved from the center, breaking the strict symmetry of Hoffmann. Additionally the curved wall on the northern perimeter was thickened to host servicing spaces. This transformation creates a silent, introverted where the untouched vegetation literally ascends to the eye of the beholder, as they walk on the roof of the thickened wall aside treetops. The new exhibition area is facing the canal and has a changeable framework, allowing curators to create different spaces on three levels. Various lighting scenarios can be achieved by opening the shutters, which display a complimentary facade to Hoffmann’s cannelure. The exhibition room’s basement is located underwater with a glass front touching the canal, leading to a direct confrontation with the element water.